Everything you need & more. The easy way to get started. You can request a quote for your statement online. This is absolutely FREE and does not obligate you in any way. Tell us a little bit about your needs so we can provide you with an estimate. We love our benefit statements! Thank you again for listening so closely as I rambled through not knowing how to explain exactly what we were looking for. When I opened our first sample, I couldn’t believe you had captured my thoughts so clearly. We’re looking forward to working with you again next year. I’ve never felt compelled to write a testimonial for a business service, but after unsuccessful experiences with a couple of other companies, I came across Benefits Summary. They’re professional, thorough, flexible and extremely knowledgeable about communicating total compensation. They’re a pleasure to work with and their high-quality statements were a hit with our workers. Benefits Summary provides a high level of service and expertise and is very responsive to ourneeds and inquiries. As I’ve done in the past, I would not hesitate to recommend their Total Compensation Statementsto any business, large or small. A significant portion of our staff is more comfortable reading in Spanish. Benefits Summary’s ability to provide both English and Spanish statements on an employee-by-employee basis was instrumental in helping educate our workforce on the value of their benefit programs. Great service, great product, great price and great people who are perfectionists in their trade. We previously provided total compensation statements using in-house software that we purchased to ‘save money’. After several years of countless headaches, I decided to track the time it actually took to generate the boring cookie cutter reports. Once I presented the results to my boss, she quickly agreed to let me engage Benefits Summary to provide our statements. Oh my gosh! On time, cost exactly what they said, great design, no surprises and my boss loves me! Benefits Summary has supported our employee benefit statements for the last 5 years. Being able to rely on their experience and expertise has been invaluable and their flexibility and rapid response has allowed us to meet our sometimes ridiculous target timelines. Benefits Summary was the third total compensation statement provider I worked with. The first was an online service that let you make your own. Yeah, it seemed attractive price wise, but it was inflexible and the outputs seemed to have a one size fits all feel. The second was a service provider who seemed in over their head. Once I talked to Benefits Summary about their process, deliverables and cost and saw them supply everything as they described, I was hooked. They’ll be who we work with from now on, and I tell all my HR friends exactly that. Benefits Summary consistently provides high quality, great value service. Moreover, they seem to intuitively understand our wishes and customize their work to provide the right fit while being creative and innovative. We have 60+ locations throughout the Central U.S., with 7 different groups of multi-tiered benefit programs. Even though I’ve been here over 4 years, I sometimes cross one set of details with another. 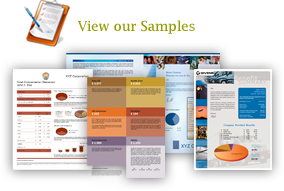 Benefits Summary was flawless in their design, production and delivery to our staff of 3,000+. Our employees were impressed with the quality and super-informed by the statement. We’re a global company with multiple locations around the world. While all of our staff is fluent in English, each is paid in their local currency and their statement needed to show it. Benefits Summary handled that requirement as easily as all of our other requests: “No Problem”. We’ve been working with Benefits Summary since 2005 and they continue to exceed our expectations year after year. Clarity, promptness, professionalism and a commitment to continually ensure we’re completely satisfied set them apart. We will definitely be lifelong clients! Having never supplied Total Compensation Statements before, I needed a partner who could describe my options and walk me through my portion of making it happen. Benefits Summary was both patient and awesome in helping me understand the pros and cons of different approaches and guiding me to what best met our needs. A definite positive impact on our employees. Benefits Summary was extremely professional and very knowledgeable in how to effectively communicate the value of our company provided benefits to each of our employees. We’re a large company whose project team consisted of HR, Benefits Department, upper management and I.T. They were able to communicate equally effectively with both our technical and non-technical staff. I can’t imagine us working with anyone else. Benefits Summary provided the most competitive pricing and outstanding service under a really tight deadline. They demonstrated excellent creativity and interpretation of our requirements. They’re proactive and a pleasure to work with. Can I recommend them? Absolutely! Copyright © 2002 – 2017. Benefits Statements. All Rights Reserved.